Q: Chairman Kim Jong Un left Beijing yesterday after wrapping up his visit to China. What did he talk about with the Chinese side? 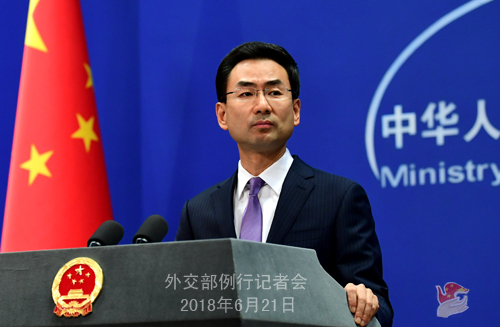 Was China's role in lifting the sanctions against the DPRK mentioned? A: The Chinese side has released the readout of Chairman Kim Jong Un's visit to China. I would refer you to that. I have nothing further to add. Q: It is reported that a special UNISPACE+50 High-level Segment to celebrate the 50th anniversary of the first United Nations Conference on the Exploration and Peaceful Uses of Outer Space was inaugurated yesterday in Vienna. 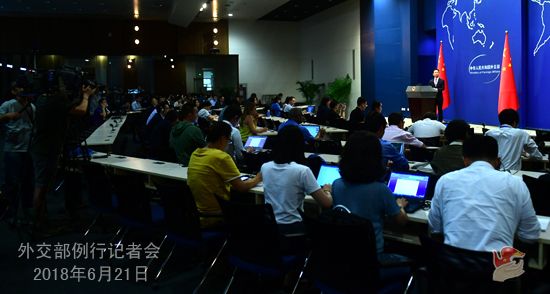 The outcome document of this meeting calls on intensifying international cooperation to realize the vision for a shared future in outer space exploration and serve the benefits and interests of the international community, as proposed by the Chinese side. What is your comment? A: UNISPACE+50, which is underway in Vienna, is a grand gathering for all to focus on the global governance of outer space by jointly reviewing the path traveled and planning for the future. The attendees at the High-level Segment agreed by consensus to incorporate for the first time into the outcome document the important concept of building a community with a shared future for all mankind in peaceful uses of outer space, which will be presented to the General Assembly in the form of a resolution for consideration. This incorporation, which represents a contribution of China's wisdom and proposal to strengthen international cooperation in outer space and address an array of complex challenges in the new era, complies with the purposes and principles of the Outer Space Treaty, meets the practical needs of outer space governance, and corresponds with the shared aspiration of the international community. China will work with all other countries to earnestly and fully implement the resolution and make greater contributions to building a shared future in outer space exploration. Q: Pope Francis has voiced optimism for improving the ties between the Vatican and China in an interview with Reuters. What is your response? A: China and the Vatican have been in effective contacts. China is always sincere about improving its ties with the Vatican and has been making unremitting efforts to that end. We stand ready to work with the Vatican to ensure that our bilateral constructive dialogues and the improvement of bilateral ties could continue to achieve new progress. Follow-up: When will China and the Vatican conduct the next round of negotiations? Will the two sides reach any agreement on the appointment of bishops this year? A: To answer it succinctly, China and the Vatican have been in effective contacts. Q: A lot of details have been provided about the meeting between President Xi Jinping and the Nepali Prime Minister K.P. Sharma Oli, who is currently on a visit here. It is reported that China and Nepal have inked a series of agreements. Can you provide us some details on those agreements? Does it include the railway line connecting China and Nepal? A: Yesterday, President Xi Jinping met with Nepali Prime Minister K.P. Sharma Oli. The Chinese side has issued the press release. According to my information, Prime Minister Oli will attend other events in China. Premier Li Keqiang and other Chinese leaders will hold talks and meet with him. Please keep following the relevant information. Follow-up: Can you give us some details on the agreements signed? A: We have issued the press release regarding the event yesterday. You may wait for the press releases of other events, for example, Premier Li Keqiang's talks with Prime Minister Oli. I hope that you will get more information then. Q: On June 20, Eritrean President Isaias Afwerki said that his country will dispatch a delegation to Addis Ababa, the capital of Ethiopia, to gauge current developments and chart out a plan for actions going forward so as to achieve the common interests and prosperity of the two countries. The Ethiopian Prime Minister has made a public response to it, saying that the constructive statement is of vital importance to realizing the common interests of the two countries. What is your comment? A: China supports Ethiopia and Eritrea in properly resolving the relevant dispute through dialogue and negotiation because it serves the fundamental interests of the two countries and two peoples. We welcome the relevant statement made by the Eritrean side and commend the efforts made by Ethiopia and Eritrea to normalize their relations. Both Ethiopia and Eritrea are China's friendly partners. 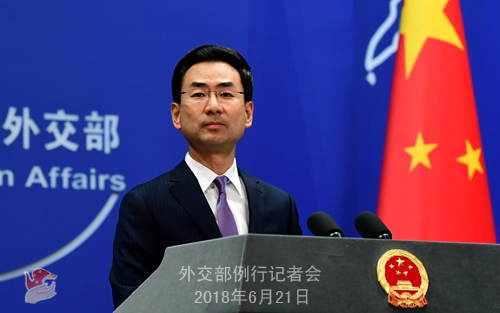 China stands ready to work with the international community to continue to play a constructive role in promoting the peace, stability and development of the Horn of Africa.